The in-laws ventured down to South Philly for a recent mid-week visit. It was mostly leisure, but we always like to get a little free labor out of my father-in-law and he helped my husband prep our bathroom for a new paint job. As my mother-in-law and I sat downstairs chatting, I got hungrier and hungrier and the two of us started checking out menus and planning where to go for lunch. We finally settled on Green Eggs Cafe, a cute, new-ish cafe in our neighborhood. Although there’s usually a bit of a wait for a table, we figured we’d be able to get in no problem at 1:30pm on a weekday. Well weren’t we wrong. We trekked through the snow only to be told there was a 25-30 minute wait. At 1:30pm. On a Wednesday. We might have waited if I hadn’t been so hungry and if there weren’t folks already occupying the comfy couches by the fireplace. Instead, we chose to head back to the Avenue and hit up Stogie Joe’s, my husband’s original choice. Stogie Joe’s has been there for a while and we’d heard great things but hadn’t gotten a chance to check it out yet. We walked through the unassuming front door and were standing in the bar. There were a few loud patrons so we opted to sit in the side room that also had a nice fireplace. This room is kind of patio-esque and actually has what looks like a garage-type door that they open during warmer months so people can be “outdoors” without actually sitting on the sidewalk. My husband had heard good things about the meatball sandwich and 3/4 of us opted for that. My father-in-law got the sausage sandwich and BBQ wings to split with my mother-in-law. 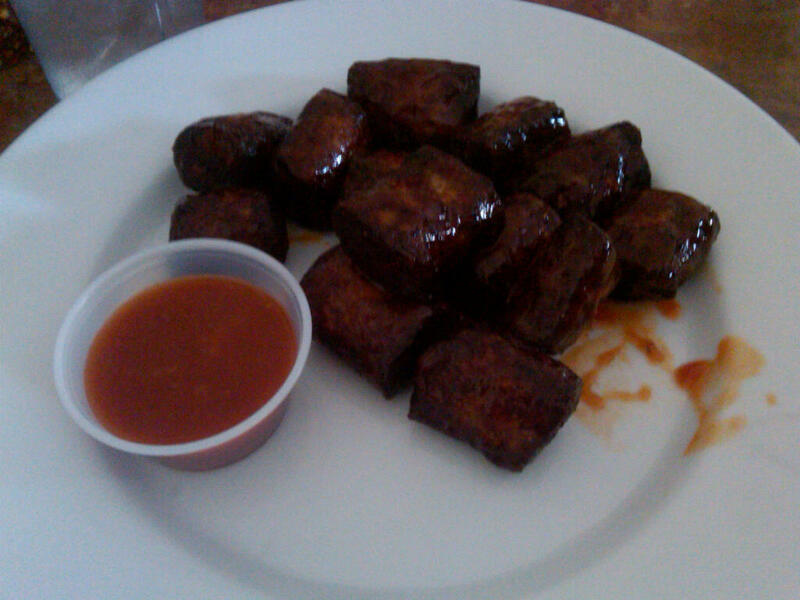 In addition to our sandwiches, my husband and I got the crispy sausage bites as an appetizer. The wings and sausage came pretty quickly. The sausage lived up to its crispy definition and had a light coating of BBQ sauce with more on the side for dipping. They were nice and chewy with a simple flavor–I enjoyed them and think they’d be a great late night bar snack, but it wasn’t the best sausage I’ve ever eaten. 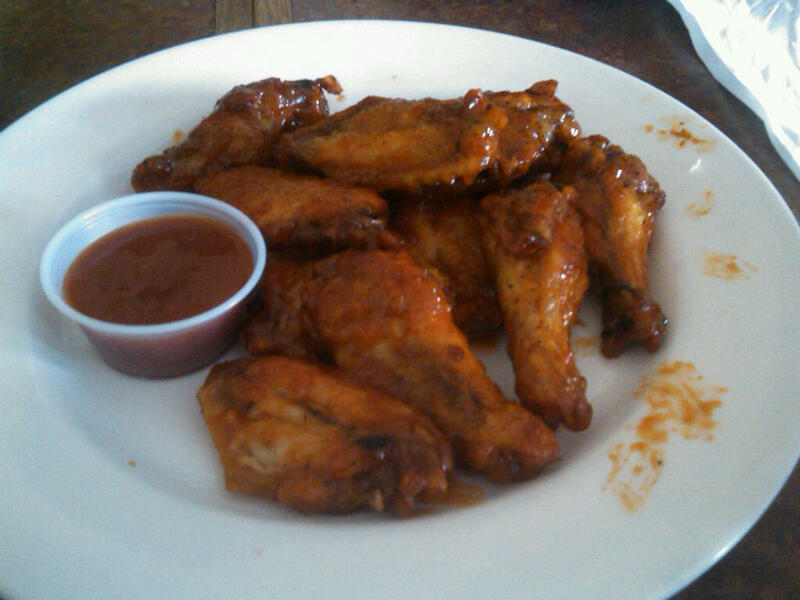 The wings were pretty good with lots of edible meat. I usually leave a ton of leftover meat on my wings because I’m not big on bone-gnawing but this meat was nice and tender and fell off the bone pretty easily. 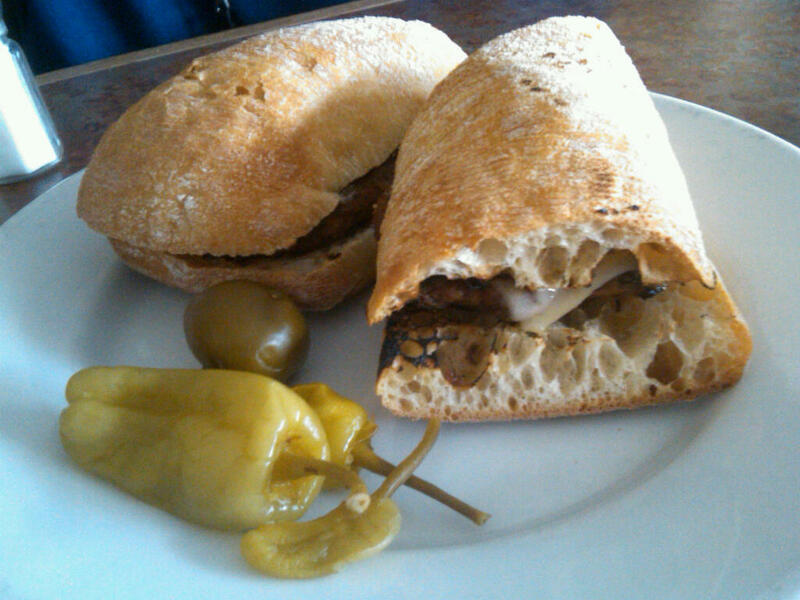 As we were finishing our appetizers, our waiter (who had plenty of local flavor) brought out the sandwiches. I had to grab a quick shot of the sausage before my father-in-law dug in. Interestingly, it was a flat patty rather than the typical long and round link. I didn’t taste it but my father-in-law felt it was a bit dry without sauce and asked for a side of “gravy.” The waiter looked at my very non-Italian father-in-law for a moment while processing what he was really asking for. Once the steaming bowl of gravy (red sauce) came, my father-in-law was quite content. 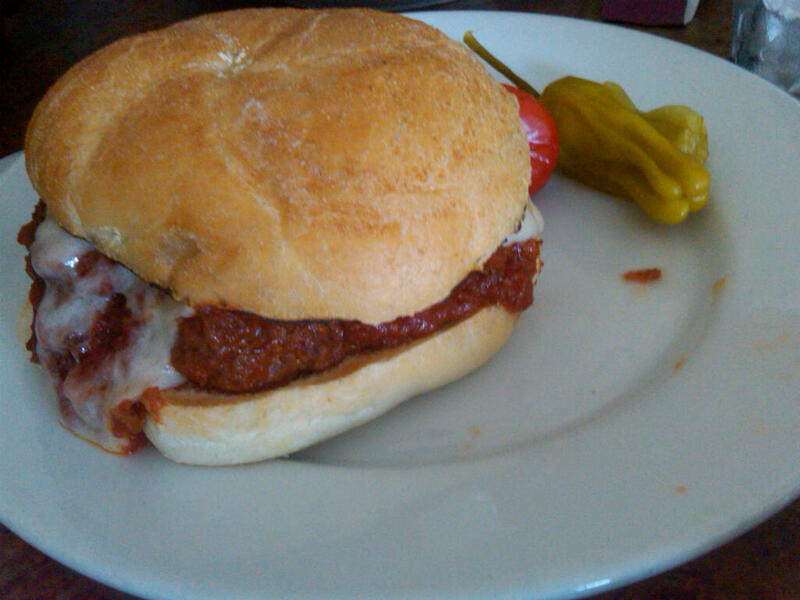 The meatball sandwiches were phenomenal. They came on a kaiser roll, which kind of surprised me as I was expecting a long roll. However, I wasn’t too worried about the bread once I took my first bite. The meatballs were large and airy and the bite of sharp provolone (we had our choice of cheese) countered the sweetness of the beef and tomato sauce. As the waiter said when he came to check on us “she looks like she needs some extra napkins. That’s a good sign.” He was right. I tore into that sandwich like it was my last meal and couldn’t get enough. There was a great sauce to meatball ratio and, although the kaiser roll made it a little messier, the soft bun was the perfect container. After a bit of a wait, we paid our check and sauntered down the Avenue on our way home. Stogie Joe’s is definitely not the place to go for a quick bite as it has a bit of the old Italian “lentamente” attitude (i.e. slooowly.) But you can count on a solid meal and service that will make you smile. And if you go, be sure to order the meatball sandwich. You won’t be disappointed.